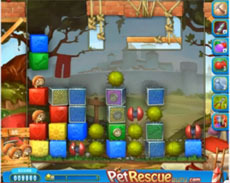 Pet rescue level 201 is difficult to complete it, because it’s possible to lose a pet while the level moves on, or stay out of moves. Your best ally to beat the level is the line blasters that fall above the screen. Use them fearless to clear whole lines in order the level to move on. Watch the following video to see how we completed it without using any payable boosters.